The easiest way to date a piece of women’s clothing as vintage is to identify whether it has a union label. 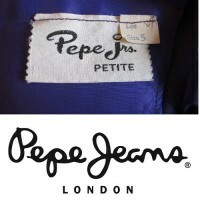 The most popular union label found in vintage clothing is from the International Ladies’ Garment Workers’ Union (ILGWU). Vintage clothing pickers and sellers often use ILGWU union labels to help identify the general era a piece of clothing was made because the union tag’s design (which has changed 8 times since 1900) can help narrow the garment’s age within a window of approximately 10 to 20 years. 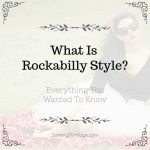 To conclude a garment’s exact era, it’s recommended that you use my Dating Vintage as Clothing and 5 Ways to Date the Age of Vintage Clothing for more help, and subscribe to my newsletter for dating vintage tips only available to subscribers. 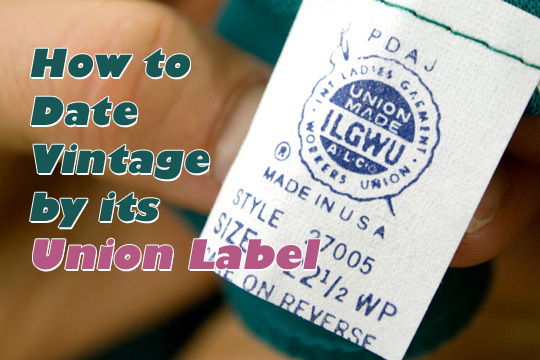 Because the top ranked search result for “union labels” is an Ebay guide sadly missing most of its original images, I decided to produce this post to give you updated materials for identifying ILGWU union labels in vintage women’s clothing. This guide is on ILGWU union labels found in women’s clothing only — guides to union labels in women’s hats, lingerie and men’s clothing will be produced in the near future! 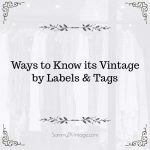 Visit my article for 13 tips on dating vintage clothing labels! Do you have a question about a union label you’ve found in a garment? Let me know what’s on your mind by leaving a comment below, or by saying hello on Twitter, Facebook. Instagram or by subscribing to my newsletter below! I decided to tackle this article to create a compilation of union labels in one place on the Internet. Unfortunately, I lack original photography for ILGWU labels from its inception in 1900 to 1936 (thumbnail available from Anjou Clothing), 1936 to 1940 and 1940 to 1955. I plan on updating this article as soon as I gather these historical materials but for your immediate benefit, I’ll begin exploration of the ILGWU union labels at 1955. Below is a brief timeline breaking down the different designs by period so that you can at least compare any of your older garments against this information to verify its age. Further description (without images) available thanks to Ebay’s union label guide by ikwewe. LOOK FOR: The words “UNION LABEL” above a scalloped crest in front of a needle and thread. 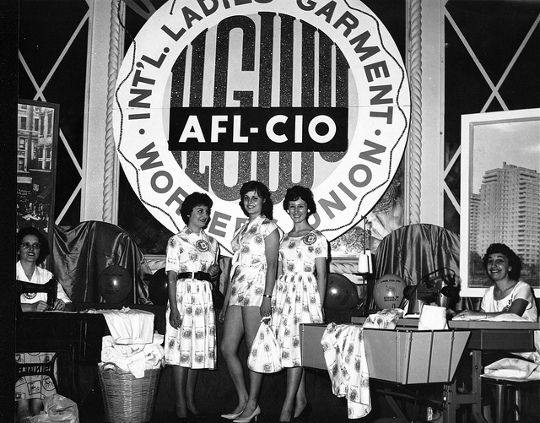 The scalloped circle has “INT’L LADIES GARMENT UNION WORKERS” written around a backdrop of ILGWU with AFL-CIO printed in white lettering in front. There is no “R” for rights on the label (you see the R emerge in 1964). HISTORY: The scalloped crest in front of a needle and thread was adopted in the ’50s. 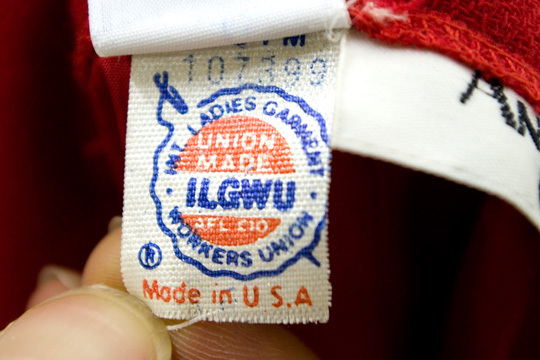 If you see an ILGWU union label without one, you can conclude the garment was made pre-1950s. The design with AFL-CIO was introduced to the label after the AFL (American Federation of Labor) and CIO (Congress of Industrial Organizations) unions merged on December 5th, 1955 under the ILGWU. LOOK FOR: Scalloped circle in front of a needle and thread, but placement of words has changed. The scalloped circle now surrounds a darkened circle. UNION MADE has moved into the circle. ILGWU is now in the foreground, and AFL-CIO is smaller and written immediately below. The “R” sign noting the trademark of this logo makes its first appearance. HISTORY: This label design was first used June 28, 1963 and was officially trademarked on April 21, 1964. The “R” symbol is therefore indicative of this garment having been produced after April 21, 1964. If this style of union label has no R, then the garment was made between June 28, 1963 and April 21, 1964. LOOK FOR: The same design as 1964 to 1973, only in red, white and blue colors. Made in U.S.A. is colored in red and more prominent below the ILGWU logo. HISTORY: As the outsourcing of garment production abroad became more common, a campaign to encourage American clothing consumers “To Look for the Union Tag” was born in 1975. The union tags therefore adopted a style makeover to the patriotic color scheme of red, white and blue. This positive propaganda even released a jingle to support its cause, which you can listen to thanks to the Labor Arts site here. LOOK FOR: The scalloped circle over a needle and thread is gone, replaced with a more minimalist style approach. “Union Made in the USA” follows. HISTORY: The quintessential design of a scalloped circle with needle and thread disappears because the ILGWU merges with the Amalgamated Clothing and Textile Workers of America (ACTWU, men’s clothing union) to form UNITE! The union also represents some clothing production in Canada. Look for CANADA written at a vertical along the tag’s edge. HISTORY: In 2005, UNITE! merged with the Hotel Employees and Restaurant Employees International Union (HERE) to form UNITE HERE. Today the union represents only a handful of clothing companies — and no brands worth writing home about. The union predominantly oversees the restaurant, hotel and casino/gambling industries. Thank you to the Family Vintage Jewels for loaning vintage clothing for creation of this article. Natalie, I HEART YOU! Thank you!!! SO helpful. 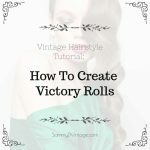 I just linked to you on my most recent vintage post. My grandmother gave me a dress about 10 years ago that has the “INT’L LADIES GARMENT UNION WORKERS” label on it. The label is almost identical to the label shown under the 1955-1963 era except that it does not say “Union Label” at the top. At the top of the label, there is a set of numbers (AAAY) with a set of numbers (935264) beneath it. Could anyone advise me on the date of this dress? hi Abby! With that label, chances are you have a garment from 1955 to 1963. No worries that it doesn’t say “Union Label” at top. Do numbers have RN proceeding? Thank you so very much!! This has been very helpful. Thanks again for you hard work. I have a question. 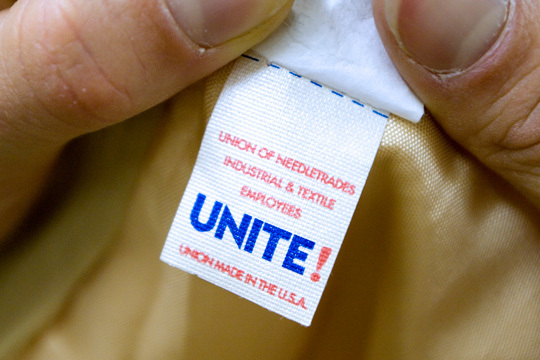 I have a garment with a union label that looks just like the 1974-1995 era ones, except the Made in U.S.A. is going up the right side of the label, and not across the bottom of it. Does this make it easier to narrow down the date of the item? Sorry, I am new to all this and trying to get things right. I appreciate any help you can offer. Thanks! This is so helpful! Thank you! very nice post!I like it very much! 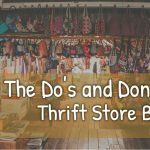 Measure your garments and then look at sizing charts online to give you an idea as to what size it would fit in today’s world. The big question remains: Why did no textile company consider just putting a DATA on clothing like most other products have in some way? Thank you for providing this resource and sharing a photograph from our collection. The Kheel Center houses the historical records of the ILGWU, and using those archives, we recently completed a historical timeline of union labels. 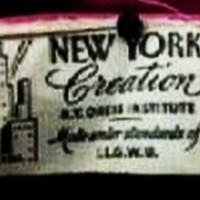 You can view the timeline itself with sample labels here http://www.ilr.cornell.edu/ILGWU/timeline/union-label-timeline.html Our hope is that by viewing labels broken down by date range, researchers can estimate their garment within a decade or so. I have a vintage bathing suite that has a red Union MAde ILGWU i am trying to find the Era of the suit. My e-mail is [email protected] if anyone has any information on this type of label. It is white tag with red writing only. Then on the other sude of the coat it has a bigget tag that says A BORGE FABRIC. BORGANA styled by Sportowne. Hi I have the same as the int log in the pic but it also has another tag styled by avan t garde large t in the middle.. I’ve had this outfit since I was a teenager does that extra tag mean anything on both pieces? This article is wonderful! 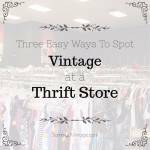 I have mostly collected children’s vintage clothing up until recently. 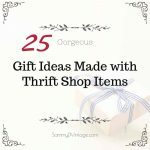 I tell myself (mostly my husband) that once I get a good collection I’ll start an Etsy shop. I do have several pieces I hang in our daughter’s bedroom as “art”. Last weekend was my first “real” (non thrift store) purchase on a vintage women’s dress (This is definitely not going in the someday Etsy stash)! It resembles very much like the 1955-63 label. Above the symbol it also has AADN and a number, 413127. The very top right side, close to the seam on the tag has a small oval/diamond shape with 191 next to it. There is a basic tag with a hand written red “3” an order# 4716 and a Style number 327 10. There are no other tags on the dress. How would I know which brand this dress is? Thank you; this was extremely helpful for dating a beautiful cloak. One thing I found out that’s not listed here is that in April, 1960, they began using labels that had “National Coat & Suit Industry Recovery Board” label on the backside. Thus, for the 1955-1963 afl-cio labels, you can further pinpoint the date by the presence of the coat and suit label on the flipside. Also, to my surprise, by that time in 1960, rn’s were already in the 920,000+. Thank you for your article! I have a black sequin vintage dress I picked up back in the 1980s and had always wondered about. Thanks to your work, I was able to date it within a year (late 1963 to early 1964).